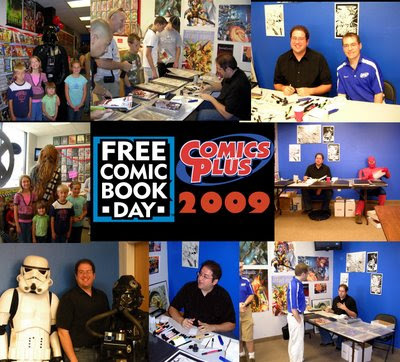 Hey Guys, Free Comic Book Day was May 2nd and Joy, the kids and I spent it in St. George UT this Year at Comics Plus. It was a great event, well attended and a fun time was had by all. I have a funny story for the day. A little boy no older than 8 came up to me and asked if I could draw his mom a picture for Mother's Day. I was very impressed with with the little guy's thoughtfulness so I said, "Sure what would she like?". To my surprise he said "Bloodrayne". I laughed in shock but replied "Okaayy!". I started drawing the card and after a while the boy's father came up and I did a double check with him and asked, "Did you know your wife is going to get a picture of Bloodrayne for Mother's Day?". He responded, "She loves Bloodrayne and Witchblade! That's awesome!". Now being doubly impressed with the little guy I gave him a free signed copy of Primecuts #1 and told him: "There you go bud, tell your Mom happy Mother's Day". Fun stuff!!! Thanks Dave, his family and friends at Comics Plus who made the day fun and exciting. Special thanks to the Star Wars Legion Cedar City Chapter, Spider-Man, Catwoman, and the Joker for making the day especially fun for me and the kids! Nice! Mentioned you on Episode 25 of the Reset Radio podcast! Hope you and Rustin can figure out a time that works to have you on as a guest!